Andy Walker and Ian Crocker take you though the weekend's Scottish Premiership fixtures. Ian Crocker and Andy Walker give you their thoughts on the weekend's Premiership fixtures, including key players to watch out for. 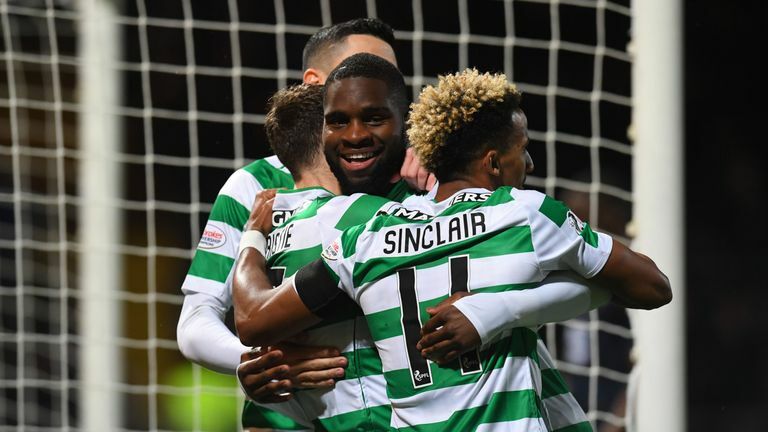 A round-up of Wednesday's action from the Scottish Premiership, including the controversy in the heated Edinburgh derby. Both of St Mirren's wins over Rangers in the Scottish Premiership have come at home, firstly in October 2008 and also in their last home game against them in the top tier on Christmas Eve in 2011, a 2-1 win with goals from Aaron Mooy and Paul McGowan. Rangers have won 18 of their 22 Scottish Premiership meetings with St Mirren (D2 L2), including a 2-0 win at Ibrox this season. St Mirren have lost each of their last six league games, the worst current losing streak of all sides in the Scottish Premiership. They have never lost seven consecutive games in the competition. Rangers have won just one of their last nine away league games (D5 L3), although that was their last such game, a 4-1 win at Hamilton in October. Alfredo Morelos has been directly involved in five of Rangers' last eight league goals (three goals, two assists), scoring both of their last two. Simeon Jackson: Somebody needs to step forward on the goal front. James Tavernier: Penalty king could make the most of getting forward. Anton Ferdinand: One of only a few St Mirren players who can physically compete in the Scottish Premiership. Alfredo Morelos: Time to score goals and, just as important, show he can control his emotions. Celtic have won 14 of their last 15 home league games against Hearts, drawing the other 0-0 in September 2015. Hearts have won two of their last four league meetings with Celtic (L2), as many as their previous 25 combined (W2 D2 L21), and could win back-to-back league games against the Hoops for the first time since August 2006. Celtic's current four game winning run is the best ongoing run in the Scottish Premiership. Hearts have won more games (four) and picked up more points (12) away from home than any other side in this season's Scottish Premiership, doing so in just five games. Scott Sinclair has been directly involved in 10 goals in just nine league games against Hearts for Celtic (eight goals, two assists), despite only starting six of those matches. Tom Rogic: Aussie loves a quality goal but would probably make a tap-in look good. Peter Haring: Austrian midfielder/defender has been quite a find for Hearts. Ryan Christie: Good to see him getting game time and showing he can handle it. Jimmy Dunne: Has added some steel to Hearts defence. This will be just the second Scottish Premiership meeting between Hamilton and Livingston after the Lions won 1-0 in September courtesy of a Steven Lawless goal. Since drawing three home league games in a row between October and November 2017, none of Hamilton's last 16 home matches in the top-flight have finished level (five wins, 11 defeats). Livingston are unbeaten in their last three away league games (W1 D2), last going four without a loss in the Scottish Premiership in December 2001 (seven games). Mickel Miller has scored half of Hamilton's home league goals in 2018-19 (3/6); he has scored all of his league goals this season so far at the Hope CBD Stadium. Livingston's league games have seen just 18 goals this season (12 for, six against), the fewest in the Scottish Premiership. Scott Martin: Former HIbs kid has been a tidy performer in Accies' midfield. Keaghan Jacobs: Capable of making things happen as Livingston aim to recover from midweek off-day. Rakish Bingham: They don't create a lot of chances but Bingham can help Accies climb the table with vital goals. Steven Lawless: Helps the Premiership new boys with his top-flight experience. Hibernian are winless in their last six top-flight games against St Johnstone (D4 L2) since a 2-1 win in September 2013. St Johnstone have won four of their last seven visits to Hibernian in the Scottish Premiership (D1 L2) - they had only won one of the first eight in the competition prior to this (D3 L4). Hibs are unbeaten in their last 14 home league games (W11 D3), scoring 39 goals in the process (2.8 per game). St Johnstone, who are currently enjoying a run of three consecutive league wins, have not won four on the trot since May 2016. Having failed to score in any of his first 22 Scottish Premiership appearances, Matthew Kennedy has scored in both of his last two for St Johnstone (two goals). Efe Ambrose: Capable of coping with a Saints side on a good run. David Wotherspoon: Back at his former club and a shift is guaranteed. Darren McGregor: Born and bred Hibs fan hoping to be back in the side regularly. Liam Craig: Will be keen to do well being back at such a familiar ground. Motherwell have won each of their last three league meetings with Dundee, as many as their previous 16 combined in the Scottish Premiership (W3 D4 L9). Dundee could lose back-to-back visits to Motherwell in the top tier of Scottish football for the first time since November 2004. Motherwell are one of only two sides without a home win in this season's Scottish Premiership; the other are Dundee. Dundee have lost 11 of their last 12 league games, including 10 of 11 this season (W1). Dundee striker Kenny Miller has been directly involved in 10 goals in his last 10 Scottish Premiership games against Motherwell (seven goals, three assists). Curtis Main: Should fancy his chances against a leaking defence. Darren O'Dea: Looks up for the fight and it will be some fight. David Turnbull: The latest teenager with great potential to come through the ranks at Fir Park. Kenny Miller: Dundee must be desperate for his talent in front of goal to start shining through. Kilmarnock's 2-0 win over Aberdeen in September was their first in 19 league meetings with them (D2 L16). They last won back-to-back games against them in the Scottish Premiership in November 2010 (four straight wins). Aberdeen have won each of their last eight league visits to Kilmarnock, their best ever winning streak away at any side in the Scottish Premiership. Kilmarnock have only lost two of their last 16 home league games (W12 D2), but one of those was a 2-0 defeat to Aberdeen in April last season. Aberdeen are without a win in their last four away league games (D2 L2), their poorest such run since August 2016 (six games without a win). Greg Stewart has been directly involved in each of Kilmarnock's last four league goals (one goal, three assists), and has had a hand in seven goals in his eight league appearances for Killie (four goals, three assists). Kris Boyd: In Greg Stewart's absence he may have a bigger part to play than of late. Graeme Shinnie: A neat goal midweek to go with the energy and industry of a proper captain. Eamon Brophy: Still playing well enough to keep the prolific Kris Boyd out the team. James Wilson: Getting fitter and sharper with every game, a stunning goal in midweek victory over Hamilton.